I have a bunch of other things to blog about including FiFi's birthday but hubby took my camera (with pictures still on it) to work so that will have to wait. 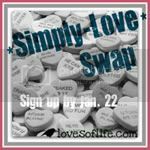 Today, thanks to Gina I stumbled across this fun swap (gift exchange) going on in the blogosphere for Valentine's Day. It is simple, head to Loves of Life, enter your information in the linky, submit the form, and viola a package of Valentine goodness will be coming your way. Of course you have to return the favor. But really, shopping and presents, what is there not to like? And the gift limit is $15 so no need to worry about breaking the bank. What are you waiting for? Head over to Loves of Life now. Maybe if you're lucky I'll be your swap partner! p.s - i'm a follower now! I am so excited for this swap! And as for blogging conferences, I'm not sure. Were you thinking of it? Let me know if so! We should work something out if we can! Shopping and presents? These are a few of my favorite things! Saw you onn Katie's blog. So excited to do this swap as well! It sounds like a whole lotta fun! Who doesn't like getting a gift in the mail? Thanks for stopping by on my SITS day, I greatly appreciate it, and now I'm here to spread the comment-love! Hi. Stopping by from SITS.